A crime reporter (Joel McCrea) sent to London to investigate the imminence of WWII falls for the daughter (Laraine Day) of a peacekeeper (Herbert Marshall) with a secret agenda. As Peary notes, while this “often neglected spy thriller by Alfred Hitchcock” is “a little too long and a bit muddled”, it possesses “several memorable sequences”, an “affable hero” (McCrea), and an “appealing” female lead (Day). All-American McCrea is an inspired choice to play one of Hitchcock’s “innocent” male protagonists, while Edmund Gwenn is wonderfully cast against type as an assassin, and it’s great fun to see George Sanders in a supporting role as perhaps the most uniquely named reporter ever: ffolliott. 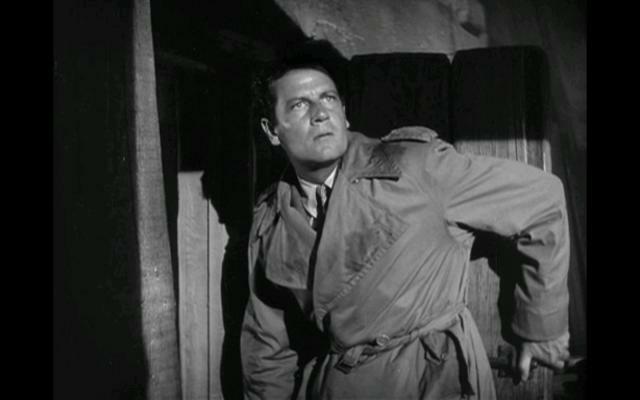 The three scenes depicted by stills below — the superbly edited assassination attempt, the windmill encounter, and the airbound finale — all rank among Hitchcock’s most indelible action sequences. 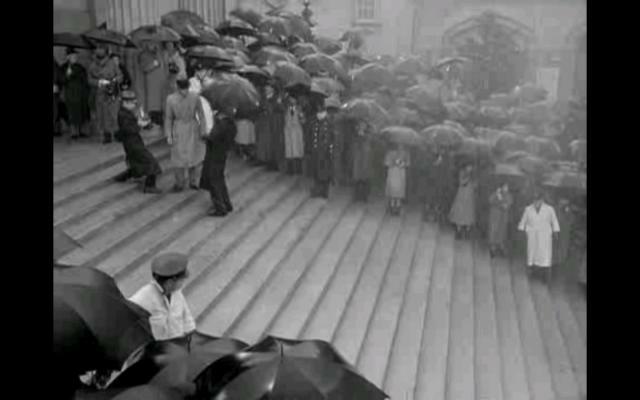 While some complain that the patriotic ending — in which McCrea urges the Allied forces to rally in their efforts against the Nazis — smacks of propaganda, it’s easy enough to forgive Hitchcock and his screenwriters, given the tenuous nature of world events when this film was released. Yes, as one of Hitchcock’s greatest “early” films. A very satisfying must! If you haven’t seen it in awhile and wonder if it’s as good as you remember…well, kids, it is! Solid entertainment: a movie with dramatic meat that’s sprinkled throughout with the lightest comedy touch. Actually, you’ll be forgiven if – as the film begins and plays out early on – it comes to your mind that you’re watching a Preston Sturges film: the opening credits are unveiled with a sprightly tune; and what’s this?! – Joel McCrea?! – doing a nutty thing with paper and scissors? 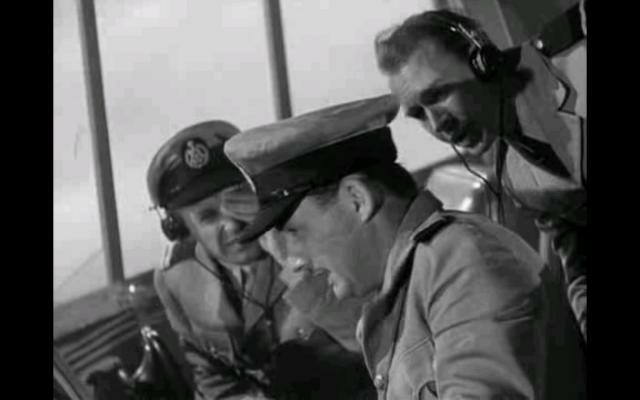 (and this is just before Sturges roped him in); even McCrea’s meet-cute banter with (the very appealing) Day sounds Sturges-inspired (again, before Sturges broke through). But suddenly – a man disappears! 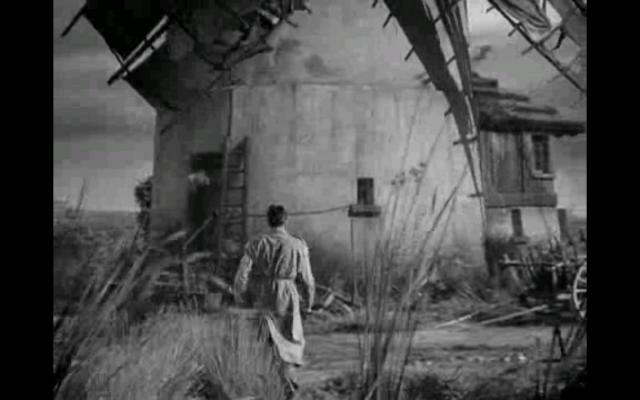 And from that moment on, the film – pretty much a “No one will believe me!” thing that served him well – is pure Hitch! – humor included: i.e., note when “HOTEL” becomes “HOT”; when a man tries to cross a road but can’t, due to a parade of on-rushing cars; when Sanders cancels his rumba lesson (! ), etc. McCrea: I guess he realized how much I mean to you. Day (noting his bedroom attire): You’d mean much more to me with your clothes on. McCrea: Oh, you like the intellectual type. Peary is correct that the film is “neglected” – I rarely, if ever, hear people mention it – but I don’t understand at all why he calls it “a little too long and a bit muddled.” To me, it rings clear as a bell; it’s just the right length and couldn’t be sharper. And, again, I’m not an overwhelming Hitch fan. But when he’s on, he’s on – and here he’s on! No over-fussing; very much like ‘Lifeboat’ in its direct, story-is-ultimately-all approach. Among Hitch’s best – and a treat for all ffs!